Happy birthday Robert Froman (Angles Are Easy as Pie), Audrey Smith (The Halloween Misfits), Ivy Ruckman (Night of the Twisters), Ann McGovern (Stone Soup), Joyce Carol Thomas (The Blacker the Berry: Poems), and Barbara Bottner (Bootsie Barker Bites). In 1961 President John F. Kennedy announces the project to put a "man on the Moon." Read Brian Floca's Moonshot. It’s National Tap Dance Day, celebrating this American art form. Read Tap-Dance Fever by Pat Brisson, illustrated by Nancy Cote; Savion! : My Life in Tap by Savion Glover and Bruce Weber; and Rap a Tap Tap by Leo Dillon and Diane Dillon. May has been designed Egg Month—dedicated to the versatility, convenience, and good nutrition of “The incredible edible egg.”TM Children’s book writers and illustrators have always been bullish on eggs—at least as the subject matter for books. Just think of classics like Dr. Seuss’s Horton Hatches the Egg or Oliver Butterworth’s The Enormous Egg. 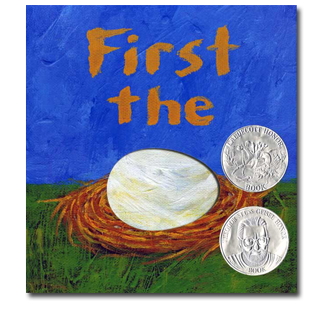 But my favorite egg book of recent years—by our most innovative and versatile creator of books for the preschool set—is definitely Laura Vaccaro Seeger’s First the Egg. After working for a period of time in television, Laura Vaccaro Seeger brought her sense of graphic design and knowledge of children to a career in children’s books. So many concept books for one- to four-year-olds are tired and formulaic, but for those just learning to enjoy books, she has created one inspired book after another—One Boy; Lemons Are Not Red; Black? White! Day? Night! As a creator, she does not repeat herself and explores new ways to use the picture-book format. In First the Egg, Seeger explores the age-old question: Which came first, the chicken or the egg? On double-page spreads, she shows us “First the EGG/then the CHICKEN.” Each cutout in the book leads to a mature form of the first picture. In a book about transformation, a tadpole becomes a frog, a caterpillar a butterfly, and a word becomes the story. 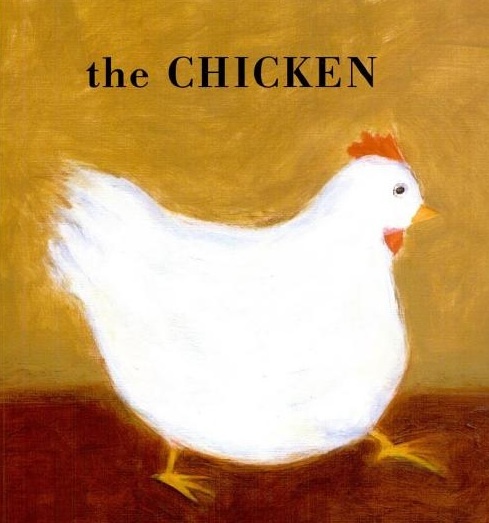 At the end of the book, the lines “First the CHICKEN/then the EGG!” turns the story around for a satisfying conclusion. This Caldecott Honor book is illustrated with brilliantly colored paintings. Each page is designed with great care, using type and art to draw the reader in again and again. Laura has taken a timeworn subject and made it uniquely her own. If I were building a library for a new baby right now, I’d first purchase all the books by Laura Vaccaro Seeger, and then add in some of the classics. Her books are both contemporary and timeless. Perfect for new readers, they also engage adults who have read hundreds of books. In a few short years, Laura has become the master of the concept book—someone we can rely on to give us one brilliant book after another. Originally posted May 25, 2011. Updated for . I have added a copy for our school library to my next Follett order! Anita, I am building a library for a new baby right now – my niece just turned 8 weeks old yesterday, and I’ve taken it upon myself to be her personal librarian. I will add Laura Vaccaro Seeger’s books to the list! Erica: Yes, I remember you were working on that library. Well, you and your neice will both love Laura Vaccaro Seeger’s books. Anita, once again you’ve flung me back to my childhood. This time to our mother-daughter tap dance lessons. So much fun! I’m so grateful to have had a mother who loved music! It’s one of the gifts she gave to me that I treasure most. I miss her more each day not less. But I am not sad, she was a happy person and I am very lucky!